I highly recommend you read through the entire recipe before starting (a step we should do with every recipe, actually), then begin by having all your ingredients chopped and ready to go. In a Dutch-oven, browning just half of the beef before stewing imparts the rich, deep flavor of searing without overcrowding the pan and having to do two batches. The juices from the browned portion of the roast will help flavor your vegetables in the initial saute’ and the remaining meat will release flavorful juices in the oven. Browning the vegetables makes a nice carmelization for added flavor, cooking until soft. Key ingredients are then added for the most flavorful pot pie in case I’ve failed to mention that this recipe is “flavorful” – tomato paste, garlic and red wine (the wine can be substituted for water, if need be). Then add good-quality beef broth, soy sauce, Worcestershire and bay leaf. Finally, add all the beef into the mix and bake this filling in the oven for about an hour and a half or until the meat is tender. After oven-braising the filling, remove to bowl. Then add a bit of water to your Dutch-oven and scrape off some of the fond that accumulated on the side of the pan. Add this complex, flavorful juice to your meat filling for optimal flavor and extra moisture. Now we’re ready to put everything together for this “bring on the cold weather” juicy pot pie. But first let me talk to you about your pie crust. As many of you know, I am a true make-it-all-from-scratch kind of woman. But from time to time, I’ve used freezer pie crusts and have had successful results with them. Just do what’s easy for you. Here it is fresh out of the oven, you just know it’s going to be good. Really good! 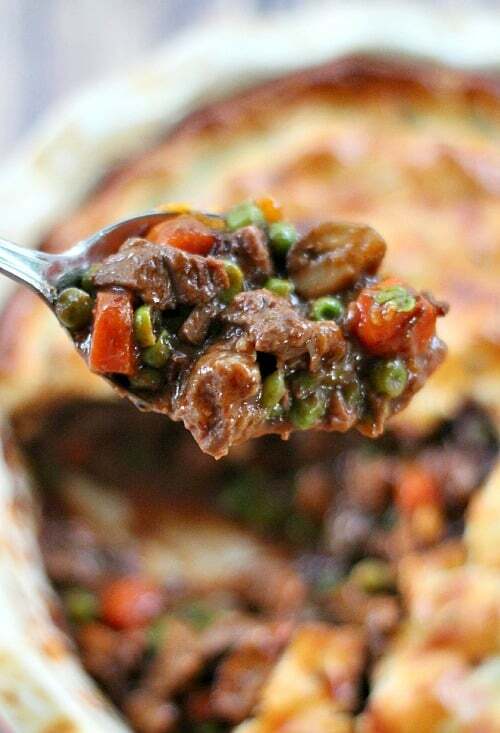 This Beef Pot Pie is going to be served around here quite often and I hope you’ll also give it a try. You won’t be disappointed. The recipe yields 6 servings, but everyone will want seconds so be prepared. Seldom will you have leftovers, but if you do, this recipe is delightful the next day and even more so the day after that. This recipe does take a few hours to finish, but it's not hands-on the entire time. The filling is pre-baked to ensure the chuck roast pieces are super tender. A nice option here is to just cook half the beef in a skillet until browned and juicy. Then add it in with the rest of the beef before putting into dish and oven-baking. Adjust oven rack to lower-middle position and heat oven to 350F degrees. Pat beef cubes dry with a paper towel and season with salt and pepper. Heat 1 1/2 tablespoons of the oil in a Dutch oven over medium-high heat. Add half the beef and cook until well browned all over, about 7 minutes. 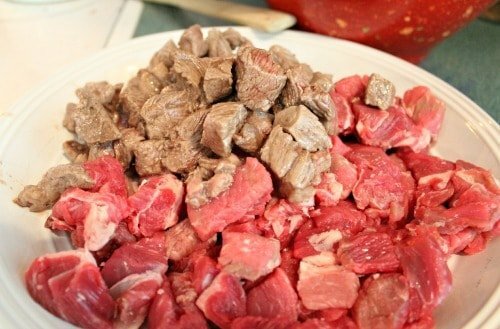 Using slotted spoon, transfer the beef to bowl or plate with the remaining uncooked beef. Reduce heat to medium and add remaining 1 1/2 tablespoons oil to now-empty pot. Add mushrooms, onion, and carrots and cook until vegetables are lightly browned, about 5 minutes, scraping up any browned bits. Stir in tomato paste and garlic and cook until fragrant, about 30 seconds. Stir in wine (or water) and cook until evaporated, about 2 minutes. Stir in flour until the vegetables are well coated and cook for 1 minute. Add broth, soy sauce, Worcestershire, and bay leaf, stirring until combined. Scrape any bits that have stuck to bottom of pan to incorporate into liquids. Add beef and bring to a simmer. Cover and transfer to oven. Cook until beef is tender, about 1 1/4 hours. Remove filling from oven and taste the beef to make sure it's tender to your liking. If it tastes chewy, add 1/4 cup water, stir and return to oven for another 20-30 minutes. Once meat is tender, remove and then increase oven temperature to 400F degrees. 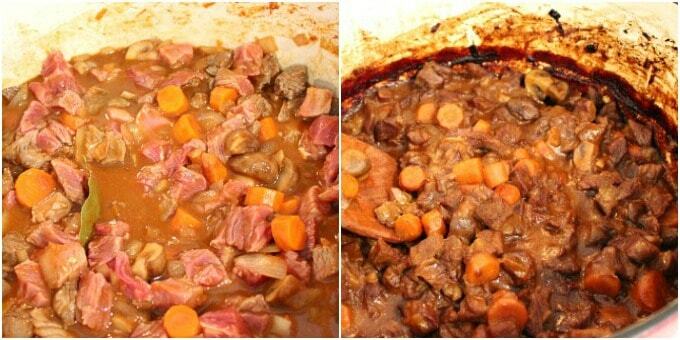 If the meat mixture looks to need more "juice", then remove mixture from pot to a plate and add 1/4 to 1/2 cup water back to the Dutch oven and kind of tilt the pan to scrape off some of the crusty fond that's accumulated in the pot. This should create a thick meaty sauce to add into the meat mixture and thin it out a bit, plus it only adds to the flavor of the beef. Discard the bay leaf and stir in the fresh thyme and add the peas. Taste the filling and add salt and pepper to taste at this time (up to 1 teaspoon salt and 1/2 teaspoon pepper). 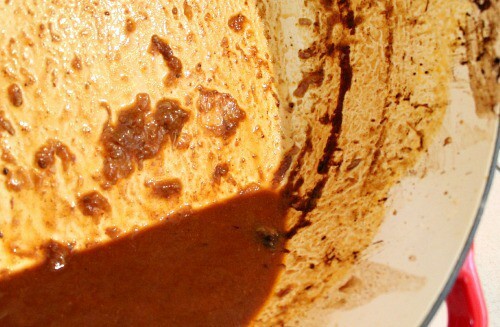 Spray the bottom of a 9-inch deep-dish pie plate and add meat mixture to the dish. Brush the rim and interior lip of the pie plate with egg (this will prevent the shell from sticking to the dish and cracking or breaking). Top the filling with pie dough so dough overhangs edges of pie plate only slightly. Fold overhanging pie down inward so folded edge is flush with inner edge of pie plate. Crimp dough evenly around edge of pie using your fingers. Using a paring knife, cut a 1/2-inch hole in center of pie. Cut six 1/2-inch slits around the hole, halfway between center and edge of pie. Brush dough with remaining egg. Season the top of the dough with salt, pepper and remaining 1/2 teaspoon chopped thyme. 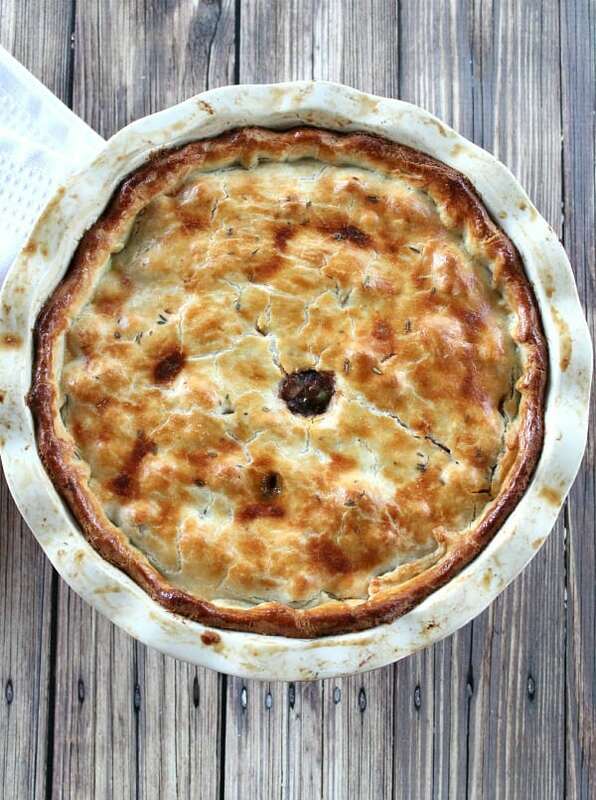 Transfer pie to rimmed baking sheet and bake until crust is golden brown, 20-30 minutes. Transfer pie to cooling rack and let cool for 15 minutes. Serve. Recipe tested, changed and adapted from Cook’s Country. WOW! Absolute hit. Used water as i didn’t have any red wine handy, and omitted the peas but substituted 2 stalks of celery instead, i added at the same time I added the carrots. Used a sirloin tip roast that was on sale, and the pie came out so tender, tasty and flavorful, even my picky eater son loved this. I also didn’t have fresh thyme, so used a generous pinch of dried. This is true comfort food. Can I make ahead? Or freeze? Hi Marcia, I never have froze it but don’t see why you couldn’t. You can definitely make the filling ahead of time and then assemble the pie and bake as usual. Absolutely hands down the best pot pie! My family loves it! I was wondering if I could make the filling a day ahead and bake it the next day? Hello Holly, I’m so glad you all liked this recipe so much. 🙂 I think making the filling ahead of time will be absolutely fine. Thanks again for making the recipe and for taking the time to comment! Excellent recipe! 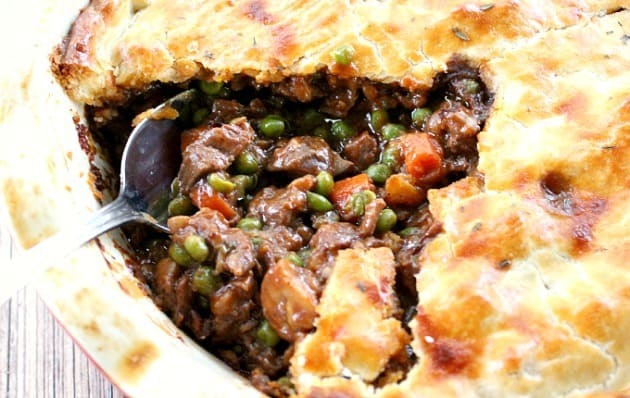 My husband loved it and he didn’t even notice that there were peas in the pot pie – and he NEVER eats peas! LOL! He also won’t eat mushrooms so I used potatoes instead. This recipe is definitely a keeper. The only change I’ll make next time is to reduce the amount of thyme that goes into the pot pie. I made this tonight with a few changes: we don’t like mushrooms so added potatoes instead, and I used mixed frozen veggies instead of the chopped carrots and peas. I cooked them and added when it said to add the peas. I also forgot the thyme, but it turned out amazing! I did put a crust on the bottom because I had one to use, but if I were to make it again, I would omit and probably use puff pastry on top. I also don’t have a Dutch oven, so I just put everything in a glass baking dish with a lid into the oven. So yummy!! Thanks for sharing this recipe!! Excellent, Sarah! Thanks for your comments and tips. I’ve had a few people ask about adding a bottom crust so I appreciate that you gave it a try. Have a great day and I’m so glad you liked the recipe. Hi! Does this recipe call for 1/2 lb beef? There seems to be a typo, listed as 1 2 lb. Also, have you tried a crust on the bottom, or do you think it would take too much of the yummy broth away? Hi Nichole, I just went in and clarified the recipe. It’s actually one 2-pound roast, so I changed it to 2 pounds of chuck roast. Sorry about that. I haven’t made this with a bottom crust not because I think it would take up too much of the broth so much as it might be create a soggy crust because of all the broth. If you blind bake the crust bottom, that might prevent a soft crust. If you do, let me know how it turns out! Thanks for stopping by for the clarification. What a delicious recipe! Tender chunks of beef surrounded by mushrooms, carrots, peas smothered in the most incredible gravy! All the flavors blend together to form a perfect union creating the ultimate dish! I had no trouble making this, thanks to your excellent instructions. My beef pot pie came out perfect!!. The whole family loved it. Thank you for sharing a delectable meal. I’ve never liked pastry pie crust, so would make this with a drop-biscuit topping instead. Any reason not to just leave it in the Dutch oven for the final baking? It would probably need to just bake a bit longer, don’t you think? Hi Tia, This would be fabulous with a drop-biscuit topping. I’d just bake until the biscuits are done. It is in the oven cooking and my taste test has me drooling for the finished pot pie. I wasn’t going to add wine because I didn’t want to open a bottle but it tasted too sweet from the tomato paste so I simmered some of the fluid out and added the wine before I put it in the oven. I didn’t have mushrooms and I know that will be a disappointment and I think it still may be a bit watery due to adding the wine at the end, but the taste was 5 stars and I will definitely be making this all winter long. Unbelievably good. Made this for the first time today. It definitely won’t be the last. Thanks for a fabulous recipe! Delicious! I was determined not to go to the store and had to make some adjustments but it was a great first pot pie for me! Thank you for sharing the recipe. Hi Julie! I’m so glad you were able to adapt what you had and that it was a great pie. Thanks so much for taking the time to stop by and comment. It means a lot. I really like to flavor combo on this but I was looking for a pot pie recipe using left over rare cross rib roast. Would this work not using fresh meat? Hi Judy, Another reader commented earlier on here that she made it using leftover roast and said it worked fabulously. I’m sure it would be perfect using your leftover roast. Really yummy pie. My family has a restaurant and this pie tasted a lot like a popular item, Guinness stew. I’m not sure how or why, I suppose the richness. I used stew meat that I had simmered down all day. I also used only potatoes, shaved carrots, shaved brussel, onion. I also used half red wine/water bc I ran out of wine!! But..Really so good! Love the recipe, thank you! Wow, Kasey! I love the idea of the Brussels Sprouts in here and thank you for the comparison to your family restaurant’s Guiness Stew. I think this would be fabulous with Guiness beer as a replacement for the wine and I think I’m going to try that soon. Thanks for taking the time to comment, I really appreciate it. A snowy day here in southern Ontario so I wanted to make something warming and “rib sticking”…wow! I followed your recipe but added one diced potato to the veggies and used white wine as I didn’t have any red. It turned out fabulous!! Thank you for sharing!! Debbie, thanks so much for your kind words and if my recipe helped to keep you all warm in any way I’m so glad. Happy Monday and have a great week! I appreciate you taking the time to comment. Hi! I wanted to let you know I used your flavor combo as the base for an “all leftovers” pot pie and it was great! My husband made a wonderful beef rib roast for christmas and there were SO MUCH leftovers. I used the bones and trimmings from the beef to make a really rich stock in the pressure cooker, then I just chopped the leftover beef, assorted veggies, and roasted potatoes into little pieces. I sauteed a scrap of onion and some garlic, then threw all the broth and food bites into the pan along with your flavor ingredients. I would have loved to add mushrooms too, but alas there were none in the house. When it came up to a boil, I thickened it, then put it in a baking dish with crust. The filling was already hot, and the crust crisped up pretty quick on convect 400. It was delicious! My husband was happy because a pot pie was his request, and even my toddler shoveled it in. I have another baking dish full in the freezer, so for a really easy dinner now all I have to do is whip up a crust and toss it in the oven. Score! So, I thought I would share this and let you know how much I enjoyed it, even though I did not exactly follow your recipe. For some reason pot pies have always struck me as a food you make to use up leftovers, rather than something you make from scratch on purpose. But I thought you might like to know a “cheater” option to repurpose a big load of feast-day leftovers! Wow Laura, this is awesome! 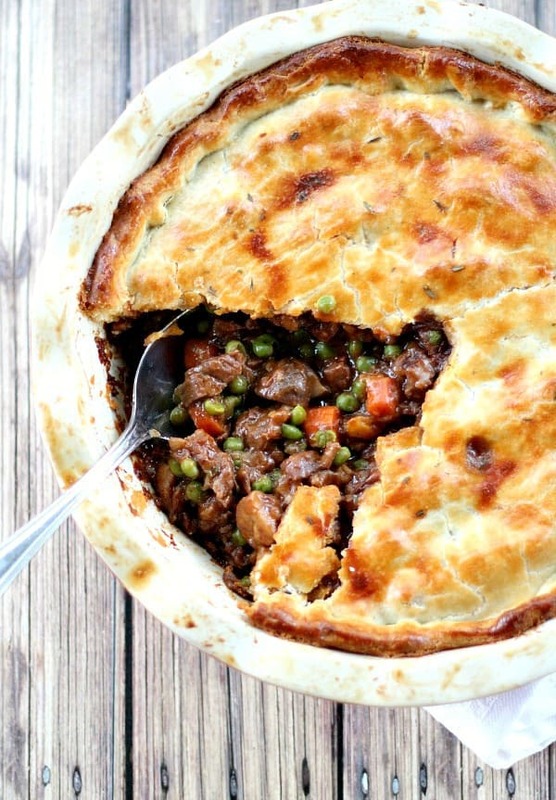 Excellent point that a beef pot pie is the perfect thing to make with leftovers. Then you get a great second meal that isn’t exactly like the first. I have a beef roast in the oven waiting for the new year right now and I know what we’ll be having the following night, should we have some leftovers that need to be repurposed. Thanks for taking the time to write such a well thought out instruction tip for a “cheater” pot pie. Happy New Year to you! This was amazing! You were right – no leftovers. Could you add some diced potatoes to this recipe? Hi Laurie, Absolutely add some diced potatoes. I’d put them in at the same time as the carrots. Sounds wonderful but I live alone. Has anyone tried to make individual pies? would beer be a good sub for the wine? Hi Kay, This recipe could easily be divided between individual pies. You could cover extra pies with plastic wrap and freeze for future use. I am so looking forward to making this dish. I have one question. What is the purpose of cooking just half of the beef. Thanks so much. Is there a different in taste if we use water or the red wine? Hi Norli, The taste would be a little less rich, but would still be fine. If you can, use grape juice in place of the red wine for comparable taste. recipe it reads as though you mix half the uncooked beef with half the cooked beef an then with the rest of the cooked ingredients bake it all together, is this correct? Hi Samantha, yes that is correct. I went in and edited the printable recipe to clarify that better. Thanks for your question. This step was a little vague in the recipe. Could you tell me the name of the wine you used please? Hi Lucille, I use different wine in this recipe all the time, just whatever I have on hand. Whatever you like to drink, use it in the recipe. Truly, anything other than a dessert wine will be great. But if you really want me to be specific, you can’t go wrong with any Cabernet Sauvignon, Merlot or Bordeaux. Just the thing for a Scottish autumnal day ? I make this, what we call a steak pie, often but not this way or with soy sauce n Worcestershire sauce but this will be the recipe to use from now on so thank you for a braw recipe ?? Shannon, I’m not sure if I understand your question. I looks like another site has featured my recipe and you have to find the cooking instructions by clicking the link to come to my site, as it appears you did. It also appears that the site featuring my recipe just organized my ingredient list by like-items for an easy shopping list. If they’re showing the picture of my beef pot pie, it does have mushrooms in it (as shown in the ingredient list you’ve given here). You could make my recipe and just leave out the mushrooms. Sally, I made this recipe on my stove top and made a double batch like I do when making my chicken pot pies. However, it turned out more like a watery stew than the thick rich gravy that your photo shows. I simmered it on a medium low boil for close to 3 hours, and never got it to thicken. I had pre measured everything and wondered if you had any ideas. 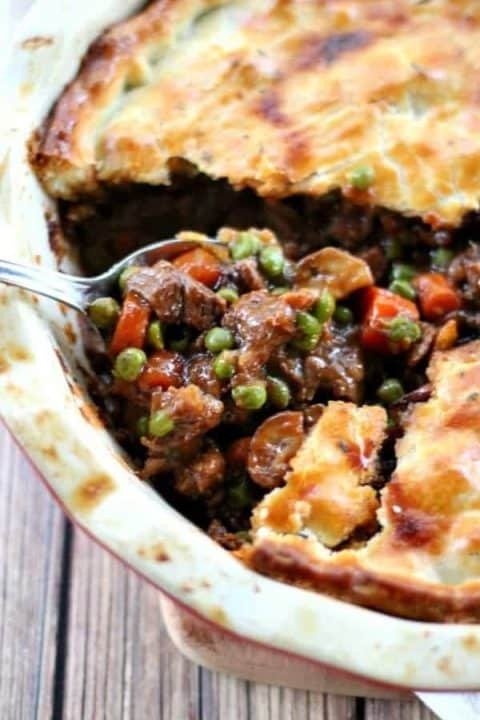 I love these pot pies and your recipe sounded best. Thanks, Katie. Hi Katie, I’ve never had a problem with the filling not thickening and I’ve made it several times. I’ve always made it in my oven and as you can see by the comments, no one has mentioned having a problem getting the gravy to thicken so I can only guess it’s because you cooked it on your stove top. Maybe when it’s cooked in the oven and the heat is coming at it from all sides, it can thicken faster/easier. Sorry you had trouble with it. I hope you’ll try it again and make it as written then let me know if you have succcess. Also, I’ve never made this in a double batch quantity so I’m not sure if that would matter either. I love fall and winter so much, I made this today for Ohio’s first non-90-degree day in months. Wonderful flavors/recipe! I DID add a bottom pie crust to mine. I baked that bottom shell @ 350 for 10 minutes to create a nice base. I also used a 9″ corningware dish so the bottom crust gave it really nice, deep side crust- yum. I didn’t have tomatoe paste and I actually really regret that…tried a little extra flour instead and while it tasted great still, I can’t totally see how the paste adds that needed zing. Great staple recipe, can’t wait to make it again! Thank you!!!! Angie, thanks so much! I am with you and LOVE fall and winter. I’m hoping that yesterday was our last 90 degree day for the year and this recipe is a great one for cooler (or any) days. I do love the tang that the tomato paste adds and your use of thyme, especially as adornment on top sounds like the perfect finishing touch for Christmas. I’ll be trying that as well. I truly appreciate you taking the time to comment and especially to give your added tips. A bottom crust is a must-try for me next time. I’ve also had other readers ask about a bottom crust so now I know what to tell them and what method to use for myself, thanks to you. 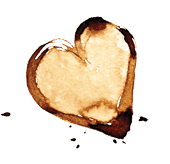 Have a great week and I hope you stop by again to try some other recipes. Hi, I am making this today being it is rainy and cool here in Michigan. I am so excited to try it! I am however going to bake it in a cast iron skillet rather than a pie dish, I am also adding a bottom crust. Oh, and I have my grand daughter and she claims to not like pot pie, so this will be interesting! I’ll let you know how it turns out! Elizabeth! I can’t wait to hear how this turns out with your changes and what a perfect meal for a rainy cool Michigan day. I’m honored that you chose my recipe to share with your granddaughther. Thank you. I made this tonight and it was THE BEST beef pot pie I have ever made and enjoyed!! My husband wanted 3 servings p, but he couldn’t fit it in. My kids ate it too and enjoyed it! THANK YOU for this recipe!! Amazing flavour. I had put surloin tips with 2 cups beef broth in the slow cooker early this morning and then found your recipe. I followed the recipe exactly, except how I cooked the beef. just wonderful, thank you!! Andi, what a great idea. I’m going to add this cooking suggestion to the recipe. I’m so glad you liked it. Thanks for stopping by and taking the time to comment. Thank you for this delicious recipe! I baked it last night, and refrigerated it to have tonight. How would you suggest reheating. Hi Amanda, I would place it on a baking or cookie sheet in a preheated 325F degree oven and bake for approximately 30 minutes or until the center is completely warmed. You might want to place aluminum foil over the top of it for the first 20 minutes so the crust doesn’t burn. Thanks for your comment and I hope you like it! Have a great weekend. This recipe is Amazing! I have made it twice now. It’s a little bit of work and definitely a weekend meal but worth every second. I may try turning the filing into a beef stew next time. Wow! This was fantastic! I stumbled upon your blog and I and my family are so happy I did! Truly an excellent recipe! This was by far the BEST pot pie! I look forward to trying many more of your recipes! Thank you! Jeff, you made my night! Thank you so much. Welcome and I look forward to having you visit and sharing more recipes with you. Let me know if you have any questions or want recommendations. Have a good night. Hi Sally..i am not sure whether i can find the readymade dough here for the crust. How do i make the dough at home for the pie crust? Do you think I would be as to replace the beef with ground beef? Wood I have to alter the recipe then? Hi Jane, This recipe depends on the juice from braising the chuck roast beef so I can’t recommend it with confidence if you substitute ground beef. But if you decide to try it anyway, I would just brown your meat and then simmer the veggies with the beef on the stove top, adding at least 1 cup of beef broth before you do. Good luck and let me know if you try it with the ground beef. I don’t have a dutch oven, just a regular glass baking dish, would that work? Hi Jessica, do you have any other regular pot that can go from the stove top to the oven? If you need to cook it in something else on the stove and then pour the filling into the glass baking dish, I don’t see why it won’t work. But be sure to cover the dish with a lid if it comes with one, or aluminum foil otherwise. Hope this helps. Could u do a bottom crust too or will filing make it soggy? Thanks. Hi Emily, I’ve never made this one with a bottom crust, and I do fear it might get soggy. The meat filling is not particularly wet, but it could go either way. Sorry, I’m not very helpful here. So after you put filling in pie plate and top with crust, it is baked at 400 degrees for 20 – 30 minutes, correct? This looks really tasty, I’ll be trying this next week. Just one question, I like to make meals ahead and freeze them for when I don’t feel like cooking, does this freeze well (post baking)? How detrimental is the bay leaf and thyme? I understand it’ll add flavor, but I don’t have either one on hand. This sounds amazing and I’m going to try it tomorrow either way! Hi Misty, without the bay leaf and thyme, you might miss a bit of flavor, but I think it will still be fine without them. Thyme is kind of “peppery” so maybe just taste before baking and increase the black pepper in the recipe if need be. I hope you like it and thanks for trying the recipe! This sounds so good, I will have to try it soon. Just one question, at what point should the peas be added? I read through the instructions a couple times and didn’t see this mentioned.